It is no mystery why pigeons, of all birds, are considered pests. They steal your food, leave droppings everywhere, and come in big packs. It can be hard to control these birds from infiltrating your home or business. The Humane Society suggests killing them is not a good option not only because it’s cruel, but because it will not solve your problem. Here are some tips on how to keep your property free from pesky pigeons. Cut their food source. Pigeons will keep coming back to an area where they know they can find food. If you feed them, whether you are intentional about it or not, these birds will come back more frequently, and with more in their pack. If you scatter bird seeds in your yard, put them in a birdfeeder to deter flocks of pigeons from feasting in your yard. Use birth control. It sounds silly, but there is such a thing as pigeon birth control called OvoControl. It’s a kibble-like food you can scatter for them to eat, which causes the pigeons who eat it to lay eggs that never develop fully. Prevent nesting. 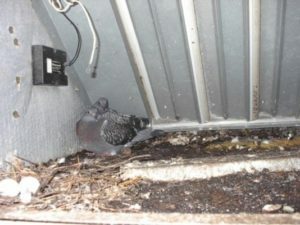 If pigeons nest on your property, it means they feel they can live safely there. They mostly look for flat surfaces to nest on, like roofs or garages. To keep them from nesting at your home or business, block those flat spaces with wood or metal sheathing, bird wires, or netting. If your home or business has a pigeon problem that can’t be fixed by anything of the tips above, trust the experts at Critter Control of Miami® to safely remove and relocate these birds. If you have any questions about pigeon removal, or would like to schedule a free consolation, call us today at 305-258-3587.